In Medak district, Patancheru lies off the Hyderabad-Pune highway. Untreated industrial effluents let out into water courses poison the groundwater, affecting agricultural lands and also the drinking waters of about 15 hamlets. In 1986, Citizens against Pollution (CAP) launched the Patancheru Anti Pollution Committee. The following year, nearly 2,000 people marched 40km from Patancheru to the Andhra Pradesh State Assembly and presented a list of demands to then Chief Minster N. T. Rama Rao. Another high point of this conflict was in July 27, 2005 when Greenpeace activists delivered bucket-loads of toxic sludge from the industrial estates in Medak district to the office of the Andhra Pradesh Pollution Control Board (APPCB) in Hyderabad. Unfurling a banner demanding that the APPCB 'Protect our Lives, Not the Polluters', the activists spread the sludge across the doorstep of the office to expose the Board's inability to deal with the chemical contamination that the local population has to face everyday. After five hours of protest, the APPCB Member Secretary met the activists along with the pollution-affected villagers, admitted the severity of the pollution and offered to discuss possible solutions to the problem. In October 2004, Greenpeace had released an epidemiological report on 'The State of Community Health at Medak District'. The study, encompassing a large sample of 10,874 people, shows an overwhelming increase in most types of systemic diseases across the study group. The background to such protests goes back to the 1980s when the Government of Andhra Pradesh encouraged the installation of medium and large industries, becoming in the nineties the second state of India for number of registered factories. The Medak district holds 40% of the industries of Andhra Pradesh and is one of the most industrialized of all India. Most of the industries are chemical and pharmaceutical. There are more than 90 Industries involved in pollution, the main ones for water pollution are: Sai Baba Cellulose, Bollaram Industrial Estate, Paks Trade Centre. For air pollution: Voltas Limited, Qure Drugs, Hindustan Fluorocarbons, Andhra Pradesh Metallurgical Eng, Chadra Pharmaceuticals. The industrial waste (treated and untreated) is discharged outside the industrial area polluting the groundwater. Much of polluted water ends up in the Nakka Vagu creek which in turn flows into the river Godavari, the second longest river India. The pollution of groundwater affect directly natural resources and consequently the health of people, their work and the food chain, in fact Nakka Vagu is the lifeblood of farmers, herders and fishermen who live in the villages affected by pollution along the Nakka Vagu. The water cannot be used for irrigation of the fields anymore. Isnapur Lake also lake receives waste flowing in through open nallahs from the Patancheru Industrial Area. Air pollution is significant mainly because of the gases released by the chemical industries. Air and water pollution has a direct impact on crops (reduction and quality of production) on livestock (quantity and quality of milk, death of thousands of animals) on fishing and on human health. Despite the representation in the Court by the farmers themselves, a Division Bench on technical ground opened all closed industries. Disheartened by this, the farmers decided to approach the Supreme Court, after a long battle of 5 year, the Supreme Court delivered interim orders- an historical judgment. It had ordered the National Environmental Engineering Research Institute (NEERI), to study the impact of industrial pollution in this area. Subsequently, NEERI submitted a report. This report acknowledging the problem of pollution, suggested a compensation to be paid to the affected people affected. In addition to this, other benefits, which resulted from people’s participation are the following interim orders given by the Supreme Court of India at various times: stoppage of effluent flow into water bodies immediately, provide drinking water to the affected villages, restoration of cultivable land by application of suitable conditioner, remedial action in respect of 13 Tanks, rectification of CETP, discharge of treated effluents into sewer line, medical care to pollution victims.... The situation is not good. In 2012, the Citizens Forum for Better Patancheru Constituency went to the Andhra Pradesh High Court highlighting the plight of villagers in Kazipally, Sultanpur and 15 surrounding villages on the banks of the Nakka Vagu River as a result of pollution from bulk drug manufacturing industry. In 2013, they filed a complaint regarding bulk drug manufacturers in Patancheru-Bollaram before the National Green Tribunal (NGT) in Chennai. A report of 2016 (Nordea) that focuses on the Patancheru area among other clusters of the pharmaceutical industry, states that "inhabitants living and working in the vicinity of drug manufacturing units in Hyderabad, Visakhapatnam, and other locations have borne the brunt of this. It has affected their livelihoods in the form of livestock deaths and decreased agricultural yields, and damaged their health, with reported impacts ranging from higher abortion rates to birth defects and stunted growth in children, as well as greater incidence of skin diseases". revenues of US$15 billion in 2014. The Patancheru-Bollaram manufacturing hub on the outskirts of Hyderabad has long been one of the most polluted industrial areas in India. The bulk drug manufacturing industry is one of the main polluters in the cluster. (Nordea report, 2016). • ordered upgradation of the existing effluent treatment plant (ETP), and asked the APPCB to establish a common ETP (CETP) (common effluent treatment plant (CETP) called Patancheru Effluent Tech Limited (PETL); and ordered the government to ensure that affected villages received treated municipality water. (Source: Down to Eath). Twenty years later the situation has improved but was not solved. Hence, in 2013, India's Ministry of Environment and Forests (MoEF)s imposed a moratorium on setting up new industries or expanding existing ones in eight industrial clusters in the country after a Central Pollution Control Board (CPCB) survey showed high pollution levels in these areas. The clusters are: Vapi (Gujarat), Ghaziabad (Uttar Pradesh), Singrauli (Uttar Pradesh and Madhya Pradesh), Panipat (Haryana), Indore, (Madhya Pradesh), Ludhiana (Punjab), Jharsuguda (Odisha) and Patancheru-Ballaram (Andhra Pradesh). ( Down to Earth, 15 October 2013). However, the Comprehensive Environmental Pollution Index (which is the basis for such decisions) is (allegedly) recalculated, if suitable. More recent focus is also put on the Patancheru-Bollaram cluster's contribution to antibiotic resistance in bacteria (Nordea, 2016). "Resistant bacteria are breeding here and will affect the whole world, said Kishan Rao, a doctor and activist who has been working in Patancheru, a Medak industrial zone where many drug manufacturers have bases, for more than two decades." (Reuters, 2016). Relevant government actors Government of Andhra Pradesh, Judicial Academy of Andhra Pradesh, BDO, Revenue Office, District Collector Office, District Medical Office, Andhra Pradesh pollution control board, Government of India, India Supreme Court, National Environmental Engineering Research Institute (NEERI). Environmental justice organisations and other supporters Greenpeace India. Patancheru Anti Pollution Committee (PAPC). Citizens Forum for Better Patancheru Constituency. The nature of the movement was always based on Gandhian principles, such as Dharna (a non-violent sit-in protest in front of the factories with hunger strike) and Street rallies, like 40km marches to the state Parliament. Other Obnoxious smell, frequent leakages of toxic gases. Impact on crop yield and food cycle. Production of crops in some areas has reduced to 80%. Milk yield decrease and is contaminated. River's fauna is no more. Other Breathing disturbances, water pollution. Also, increased antibiotic resistance as a more general consequence. The Supreme Court order gave right to compensation to the affected people, but not been implemented yet. The goverment of India has decided a couple of times to stop growth of this polluting chemical-pharmaceutical cluster, but then it has retreated. Why? Explain briefly. Due to the lack (especially at the beginning, during the crucial part of the fight) of support of big national and international organizations and political parties, the movement achieved some results by their own efforts. Unfortunately, the chemical and pharmaceutical lobby and the high level of corruption made that basically the situation did not change much. The Patancheru environmental protection movement went on, at the Supreme Court level. The Court gave interim orders and reliefs as and when its attention is drawn. Though there are some landmark orders given by the Indian Supreme Court, implementation has not been effective. Slow improvements but still alarming situation. Affidavit filed by the Revenue Divisional Officer, Sangareddy before the A.P. High Court, Hyderabad, December 5. 1987. Judgment of the Division Bench Comprising Justice Jeevan Reddy and Justice Sivaraman Nair, A.P. High Court, Hyderabad, 26th April, 1990. Affidavit filed by the Andhra Pradesh Pollution Control Board before the A.P. High Court, Hyderabad, Feb 20. 1990. Hydrogeochemical characterization of contaminated groundwater in Patancheru industrial area, southern India. Reddy AG1, Saibaba B, Sudarshan G.
State of Community Health at Medak District. Publication - October 26, 2004 (with link to 70 page survey). Tushar Dhara and Anil Cherukupalli, The cost of cheap medicines. Antibiotic pollution in Patancheru. AND ENVIRONMENT IN INDIA. RESEARCHED AND PREPARED FOR NORDEA ASSET MANAGEMENT BY CHANGING MARKETS AND ECOSTORM. 2016. Report of Medak District Medical Office on Health Survey, 2001. Report of APPCB on Industrial Pollution in Patancheru, 1998. Report of CPCB on Industrial Pollution in Patancheru, 1998. 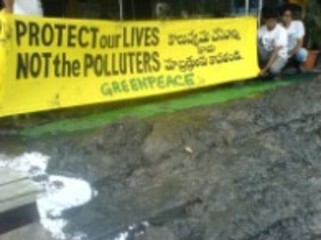 Greenpeace delivers Toxic Reality of Patancheru to AP Pollution Board. Polluters under MoEF scanner, Sugandh Juneja, Down to Earth, 15 October 2013. Other Comments Nordea report, 2016: "... people living in the vicinity of dirty pharmaceutical manufacturing sites, who are often poor and reliant on subsistence farming, are those whose health is at most immediate risk from the toxic effluents and API-laden waste being deposited in their rivers, lakes, groundwater and fields... (moreover) because of the way in which antibiotic manufacturing discharges trigger resistance in bacteria present in the environment, spreading to human pathogens which then travel the world, antibiotic pollution puts everyone at risk, wherever they live. " (API means the active ingredients in a pharmaceutical drug).